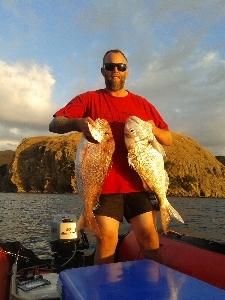 This second, concluding feature by Ben Carey continues to profile the various natural elements contributing to hot sport-fishing – especially those indicated and provided via technology. This time he focuses on recognising the nutrient-rich upwellings and their relation to sea-surface height, as well as the role of the sea-surface temperature ‘breaks’, and how they can be determined on charts. Ocean currents move around New Zealand in predictable ways. Basically, there is an open water surface current (which you can usually identify on any sea-surface temperature chart) and a much colder deepwater current located deep down near the seafloor. Underwater topography, such as seamounts, underwater hills and sea-valleys, affect these currents in various ways. These high and low points on the ocean bed can be identified on Sea Surface Height (SSH) and Sea Surface Temperature (SST) charts if you know what to look for. Bear with me and I will explain how these charts can help you find tuna schools and marlin. Upwellings and Sea Surface Heights (SSH) Some satellites are equipped with instruments called altimeters. They are incredibly accurate and measure the height of the ocean’s surface to within a few centimetres by sending out a microwave pulse from space, bouncing it off the ocean’s surface and measuring the return signal. The surface of the ocean isn’t flat – there are high spots and low spots. The SSH imagery data indicates the ocean surface height in relation to mean sea level. By studying the latest imagery, you can use the data to locate areas of upwelling and downwelling. Although this may seem counter-intuitive, the important upwellings can be identified by areas on the SSH charts that are lower than surrounding areas. So how does this help locate the fish? Here is a local example: off Great Barrier Island, and particularly up towards the Kermadec Trench, the underwater terrain and structure largely consists of vast canyons, knolls, volcanic seamounts and sea valleys. Any bathymetric chart of the region between Northland and East Cape, should show several interesting structures. These underwater structures interrupt the colder, deep-ocean currents and can cause this nutrientrich water to get pushed to the surface, resulting in upwellings. This cold ocean water is packed with the vital nutrients that plankton need to grow. Once the nutrient-rich water reaches the surface it interacts with sunlight and the warmer surface current, allowing microscopic plankton to start multiplying – photosynthesis. This creates the base of an ecosystem that attracts small baitfish (such as saury) and squid, bringing in the deep-water uglies that feed on them, and, in turn, bigger fish predators such as marlin and tuna. Upwellings on a sea-surface height chart with a sea-surface temperature overlay can also be identified as areas of colder water surrounded by boundaries of warmer water. On the charts, an upwelling is identified by the cooler green water on the left-hand side, surrounded by the warmer surface water. Traditionally, the best areas to fish upwellings are between the area of the upwelling itself (low point) and where it transitions into warmer surface current (high point), as the plankton – and, consequently, the food chain – in those areas has had time to develop. Temperature breaks provide a clear distinction between bodies of warm and cold water. These can be identified on any FishTrack or seasurface temperature (SST) chart by the black contour lines that can be drawn along them. Steep contour lines indicate strong temperature breaks. 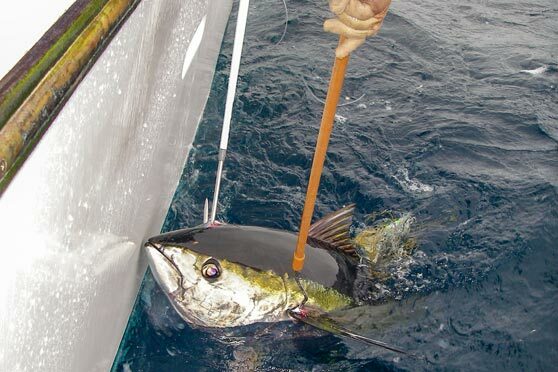 Commercial tuna skippers often look for temperature breaks when searching for yellowfin and bigeye tuna, because the tuna will be found patrolling the edges where the warm water meets the cool water. Tony Walker and I have also seen plenty of marlin smashing the living daylights out of the baitfish, as well as albacore tuna, southern bluefin tuna and mahimahi in such areas. When shooting surface longline gear over temperature breaks, we generally do so right across the break, from the cool water right into the warm water, because the leading edges generally have the baitfish stacked up on one side and the gamefish on the other. Baitfish seem to like the cooler water side of the temperature break with its nutrient-rich water; in summer there may be a lot of sauries and flying fish feeding on plankton and krill, with albacore and skipjack tuna chasing them, and marlin not far behind. When temperature breaks form, keep an eye on them for two or three days before venturing out on the water, because it usually takes at least three days for the food chain to become well established, especially if the temperature break flows over offshore underwater structure. When we are surface long-lining, we look for temperature breaks between 1–1.5 degrees or greater. You can see the temperature break on your temperature gauge when steaming over it – the water temperature will either shoot up or down very suddenly. 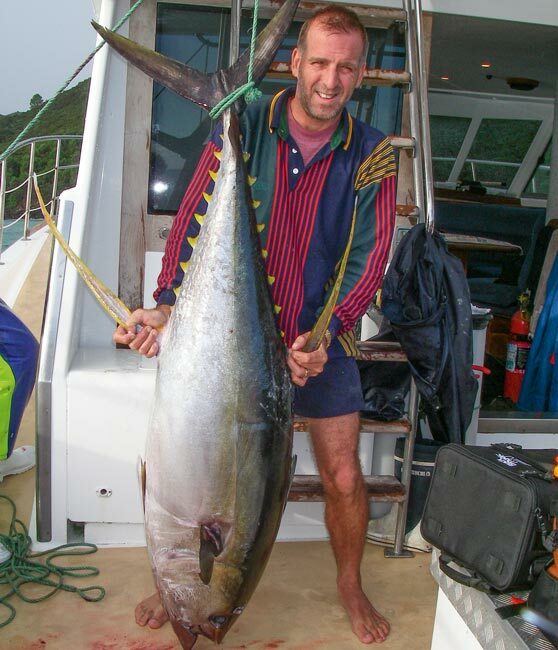 The most productive temperature breaks generally have the greatest temperature difference on either side; they often hold good numbers of bigeye and yellowfin tuna in the Far North and off Great Barrier Island over December. The tuna tend to be found around the temperature breaks because they are fast swimmers and use a lot of energy to chase baitfish, so require a higher core body temperature than the surrounding water. Then, after feeding, tuna need to bring their core body temperature down, and that’s where the nearby cooler water is useful. Tuna, marlin and other pelagic fish patrol these underwater highways, continually herding and pushing the baitfish back and forth across these temperature boundaries to shock and disorient them. The sea’s surface topography is affected by currents, water temperature, and structures such as underwater hills, seamounts and deepwater trenches. Underwater structures can create upwellings from the sea floor which appear as cold green water on SST charts. When underwater currents are pushed to the surface, they bring all manner of nutrients with them. Once there, a combination of light and heat kicks off plankton growth. Plankton is the basis of the food chain, and in just a few days an eco-system can form there. This part of the Bay of Plenty shows upwellings over an area between two offshore knolls. If planning on chasing bigeye tuna, run from White Island to Cape Runaway in January, as the surface longliners do. Try to fish areas where the (black) Sea Surface Height contour lines intersect with the (coloured) temperature breaks. 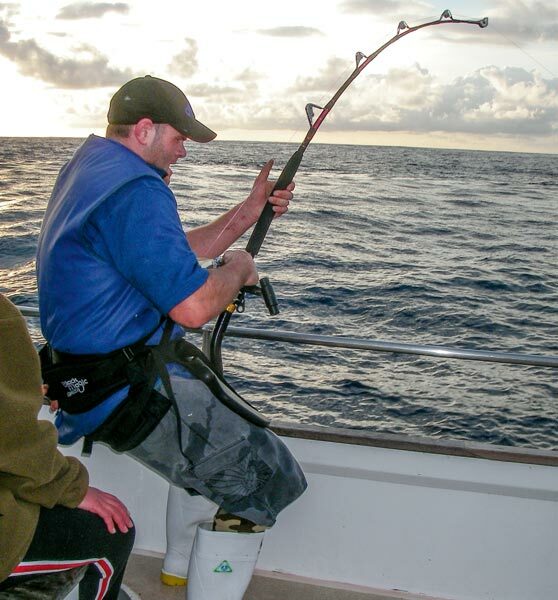 You should find game fish, including broadbill, blue and striped marlin, bigeye, yellowfin, or southern bluefin tuna and mahimahi. Commercial tuna skippers often look for temperature breaks (the yellow to orange transition at the centre of the chart) when searching for yellowfin and bigeye tuna. The tuna will be found patrolling the edges where the warm water meets the cool water. When setting surface long-line gear on temperature breaks, commercial fishermen generally shoot it right across the break, from the cool water right into the warm water (yellow to orange), because the leading edges generally have the baitfish stacked up on one side and the gamefish on the other.